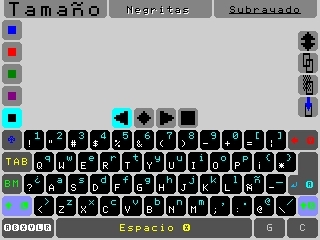 Description It is a Text editor, it is in spanish, but its kinda simple to use. Instructions bottom screen Up side: Big Letter - Bond - Underline Left side: Text color Right side: Select tool - Copy - Cut - Paste Down side: keyboard- up-left corner is the conf button with "save", "load", "new" and "toggle detail file on/off on start" Above keyboard: Left, Center, Right and Justify text. When you select some text, you can change the format or color of this or delet it. You can use the botton A to "enter", Y to "backspace", X to "space" and B to "close". Also L or R to "shift" and Pad to move the cursor or L/R+Pad to move the cursor even more.